During my journey as a Development Manager in SAP, I was constantly looking into different ways to bring innovation into the workplace. From 2016 to 2018, in SAP Labs Latin America, I led a team to implement practices towards pillars of self-management, wholeness, and a deeper sense of purpose for people in my organization SAP Innovative Business Solutions. I was deeply inspired by the Evolutionary-Teal practices presented in the book Reinventing Organizations (Frederic Laloux). Although we evolved in all pillars, my focus here is on one aspect of wholeness. Wholeness is all about how to bring yourself to the work environment by removing the corporate masks. Creating an environment that inspires people to be and to be seen as who they truly are is extremely challenging. Feedback is one way to go towards that direction, but it requires preparation and practice. During this journey, we realized that feedback is a practice of care for each other and that could significantly improve our team spirit. Used in the right way, it is extremely powerful. Used badly, can be very destructive. We put a small team together to research commonly used feedback techniques, interviewed some people and tested a few techniques. A small workshop was created, and delivered to the whole team to share the techniques we believed would work best for us. The following sections briefly describe assumptions and practices you could use as a feedback giver or receiver. All images created with SAP Scenes. You care about the other person and that is why you give feedback. Believe that every action has a positive intent. With this in mind, you remove judgement from the conversation. The other person is a human being (!) and has his/her own beliefs, strengths and difficulties. You are in no way better than the other person. Dedicate enough time to prepare what you are going to say. Remind and describe the past situation (what/when/how) as it gives you enough data for a meaningful discussion. Ask the receiver for permission to give feedback. You cannot guess what the other person’s state of mind is like at that moment. For example, if a family member is sick on that day, your feedback will not be absorbed in the proper way or it will be completely ignored. I consider this the most important step in preparation. Find a comfortable and private environment to give feedback. According to Brené Brown, “I know I’m ready to give a feedback when I’m ready to sit next to you rather than across from you”. If you are a manager behind a table, you are already establishing a big power distance, meaning the other person will start in a losing position, unconsciously. Sitting next to the person, sends the message that “you are both equal and we are on this together”. Your focus is only the other person – not the surroundings or your inbox. You are curious to understand each others perspective. It is all how you are impacted by someone’s action – and not the person himself. Stay quiet and attentive: do not speak or get defensive while receiving the feedback. Mirroring and sensing: try to sense body language and voice tone. Feel the other person. Paraphrase: it is a powerful technique to pulse check your understanding of the feedback. Ask questions: open ended questions help you to explore ideas. Strive to understand why one feels that way -> remember the positive intention and that everyone is different. Strive to give examples -> describe the situation with facts. 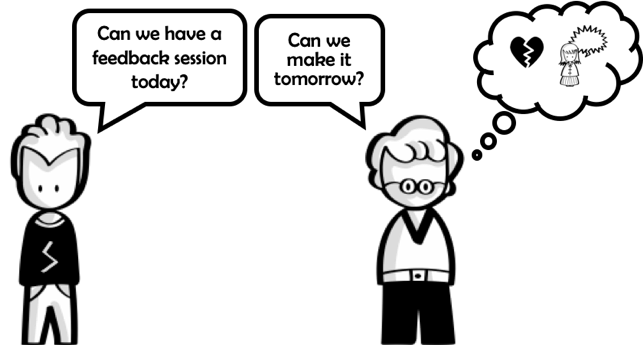 Strive to maintain the dialog -> feedback is a two-way communication. Strive to tune in communication style -> establish rapport for better results. Strive to be clear, do not filter things out -> clear is kind. Strive to use I-messages: they help us to express ourselves without pushing the other into a defensive corner. Observe and offer opportunity for reflection and response. 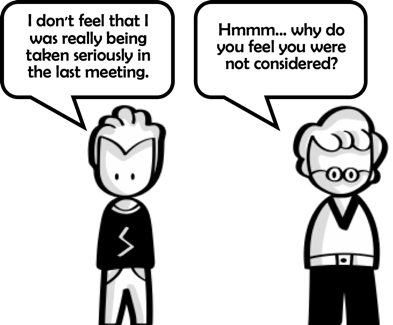 For example: “I noticed that we’re starting our meetings late. I feel frustrated. I need our meetings to start on time, so I can keep up with my daily schedule.”. 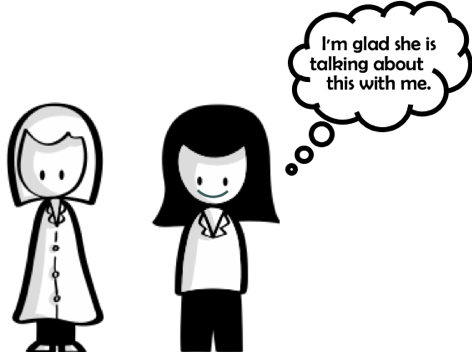 Avoid feedback conversations in front of others -> privacy fosters confidence and open dialog. Avoid feedback when you are emotionally upset -> be focused on the feedback. Avoid solving people’s problems -> help them to find solution themselves. Avoid judgements and comments on personal level -> focus on facts and examples. Avoid using “If I were you” -> no one besides you, can be you. Avoid procrastinating -> timing is important for both parties (giving feedback for something that happened one year ago has no value). Avoid the You-Message “You are unpunctual” -> it puts you in a judging position, in a higher hierarchy, pointing out and being conclusive. There are subtle evidences that help to measure the effectiveness of a feedback. 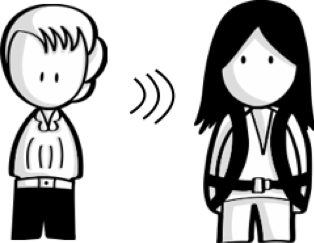 Receiver listens carefully -> you feel the person is with you showing interest to the conversation. Receiver appreciates the feedback -> it is about remembering you care about each other with an open body language. Receiver accepts and contributes -> the receiver shares thoughts and asks forward-thinking questions about the feedback. Receiver justifies or argues against. Receiver ignores or denies -> receiver is presenting closed body language and does not acknowledge the feedback. Receiver quickly forgets the feedback -> you notice when the person is not in sync with you and you feel alone in the conversation. Giving feedback requires some structure. There are many available, but we found the ones below more adequate to our team. The usage of one approach, or no approach at all, depends on the complexity of the feedback and how well you know the receiver. Even Better If -> “you could speak a little bit louder”. Focus on what a person can do or has control over. Note: this may look like sandwich approach (praise/criticism/praise), but it is not. Actually, I don’t like that model and I never use it, because it totally fogs the feedback. Situation: identify the specifics of the situation, incident, and event, such as location and time. e.g. “This morning in our meeting…”. The tips herein are flexible and almost impossible to be followed as-is in a feedback session. Just take the ones you feel right for you and start using. Have the courage to start and you will get better with time. Remember that feedback is not only about things to improve. Make sure you recognize when a person is doing well. That’s why these tips are valuable, because you can use them in any context. I have recently read Dare to Lead (Brené Brown) and her studies on vulnerability and courage resonated a lot with me. In the future, we could revisit our content to do changes based on her insights. But I’m happy to know we came up with recommendations that have commonalities with Brené’s learnings – of course not so formal and structured as hers. The workshop we crafted was only the first step. It takes a lot of time and energy to keep the people engaged in constant feedback. But I can assure you that the results are great. Feedback raises trust. And trust is the ultimate fuel for any team. While I finish this, I’m just curious, how feedback is part of your team’s culture and what are the approaches you use? PS: In case you want to facilitate a workshop with this content, please reach out to me and I will share free materials and guidance! And thanks Merilis Rusch and Debora de Souza for reviewing this blog post! Thank you Guilherme Lage for this insightful post on the feedback workshop you conducted at SAP! It’s amazing how many things can affect whether feedback is received and accepted. The physical shift in position you mentioned makes sense and I can see how this takes the pressure off not only the person receiving feedback, but also the one giving the feedback. In my face-to-face coaching practice, when I sense that my client is either uncomfortable opening up to a topic, or is a bit low on energy, or is a bit distracted, I often recommend a walk together. This side-by-side position and walking action does wonders to help my clients relax, focus, and feel more comfortable opening up. Those who practice mindfulness can appreciate the consistent and measured cadence of one breath after another (or one step after another) to focus the mind. Thanks again for the post and practical tips!